Copenhagen's Lord Mayor, Frank "Le Corbusier" Jensen continues his fight for a car-centric Copenhagen that would make the 1950s proud. What makes matters worse is that the Robert Moses Fan Club that is the Danish Congestion Commission (Trængselskommission) are also using a time machine to travel back to the congested past at the moment. A colleague told us very recently that they are seriously discussing widening the motorways leading into Copenhagen because of the traffic jams. Can you believe that? With all the available knowledge, with all the moves away from motorways around the world, these clowns are tying us to their back bumpers and dragging us into that previous century that exists in their heads. The subject of 30 km/h zones was brought up at the Congestion Commissions discussions. According to Jens Loft Rasmussen, head of the Danish Cycling Federation (DCF), the room went kind of quiet. Nobody knew quite what to say. In a flash, the proposal was wiped off the table like spilled coffee. Jens tried to tell them that the DCF had experienced them on a recent study trip to Gothenburg, Sweden. This time, the commission member from the FDM (Denmark's automobile association) stated that one city with 30 km/h zones wasn't enough to consider them. I told Jens that I would email him some of the content from our Danish 30 km/h group on Facebook - 30 kbh. That led to us here at the Copenhagenize Consulting office deciding to whip up an analysis wherein a great deal of information is gathered into one place. Our environmental engineeer, Pedro Madruga, went to work. The document we prepared is made public and available for anyone to download. Please use it wherever you can and it is our hope that it will inspire and inform. If you have any suggestions for additions, please let us know. If you're in Europe, please also sign up for the 30 km/h zone Citizen's Initiative. It's a long way to 1 million signatures but the journey has begun! Not surprisingly, Lord Mayor Frank Jensen isn't in the 30 km zone himself. He is in a different league than mayors in other cities. He said recently, "I think we're the only capital in Europe that accepts that parts of the city centre is a thoroughfare. If we get more cars underground, we'll create more space for bicycles and public transport." What is scary is that he actually believes this. He obviously hasn't been to Dublin and visited The Quays or to Paris to see the expressway along the Seine, just to name two European capitals. The difference is that the Mayor of Paris is planning on ripping out the expressway and Dublin is working hard to figure out how to reduce traffic along The Quays. The latter involves a project that Copenhagenize Consulting is working on for the National Transport Authority in Ireland. 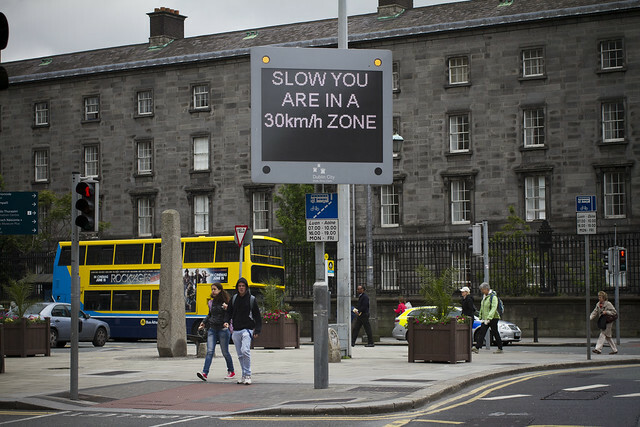 Not to mention the fact that Dublin has many 30 km/h zones and has banned heavy goods vehicles from the city center. These cities are not sweeping cars under the rug - they are trying to get rid of them and encourage other forms of transport, and their mayors are leading the way. Sure, our little Nordic capital is expanding our mini-Metro - another ridiculous project worth a few billion that will have a negative effect on cycling levels/public health as well as small businesses on street level by shepherding the masses underground. Simply because the current crop of Danish politicians are afraid of removing the cars from our streets. Instead of doing what the rest of Europe is doing and building tramways down the main arteries, they continue to create space for cars. Here's a great article about how large infrastructure projects in Australia are failing. EDIT: We uploaded a newer version on November 22nd (3.20pm GMT+1). If you downloaded before, please do it again. Thank you.